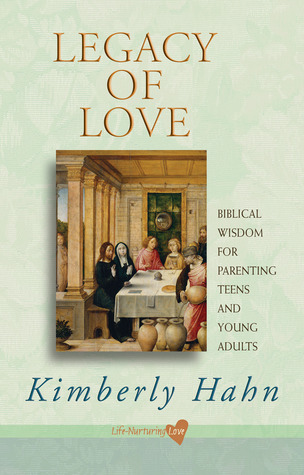 It was a delight to read Legacy of Love: Biblical Wisdom for Parenting Teens and Young Adults by Kimberly Hahn. When I received the book from The Catholic Company for review, I thought that it would probably be a reference book and not one that I would easily read from back to front. I could not have been more wrong.Legacy of Love is a book that kept me up at night. I would promise myself to finish just one more chapter, and then the next chapter would draw me in to yet another block of sleepless time. This book is the fourth installment in the Life-Nurturing Love series based on Proverbs 31:10-31 and I believe God had a hand in delivering the copy I needed at this moment in my life. Raising a child of God in our culture requires a firm commitment to the Domestic Church which is lacking in many Catholic households.When our son was born, I was struck with the awesome responsibility we were given in order to raise this child to be a Godly man. Mrs. Hahn's words spoke to me like I was her only intended audience. It was written expressly for me.In discussing the attitude toward parenting teens, she said "Each child is a gift from God. God is the source of all good gifts -- including our teens. He has the wisdom and knowledge we need to parent our teens with grace, attentive to the child maturing before us." Her words are comforting and reaffirming as those thoughts were already ruminating in my heart. She goes on to point out that how much our attitude toward the teen years -- whether we anticipate disaster or delight -- makes a great difference in our parenting. In the chapter entitled "Preparing Your Teen for the Love of His Life" I discovered that Mrs. Hahn and I agree on many points in regard to dating. She also offered many things to consider which I had not yet thought of. Helping our children to understand the purpose of dating, and cautioning our children about the recreational attitude of dating in America are both very important. After all, what is the purpose of a child in fifth grade dating? One would hope they wouldn't actually go out on a date, but why have to be paired up at all? Dating is a big risk for our children and it restricts them from having a social life. As Mrs. Hahn points out, "Maturity is necessary for a lasting marriage. Why allow teens to have serious romantic relationships when marriage is unlikely for years?" Indeed! If your children believe they may have a vocation for the married life, why encourage them to shop for a mate like they were shopping for clothing? Don't we all know kids who 'try on' a 'girlfriend' or 'boyfriend' only to decide they don't fit after a few days?This lovely book is divided into six distinct parts, each based on a portion of Proverbs 31. Quotes from Scripture and Church teachings are found on every page, providing much needed guidance for any Christian mother. Readers will learn how to cope with teens and set boundaries, nurture your teen's soul, encourage older teens and young adults as they navigate healthy dating and courtship, and becoming an in-law and grandparent. The message I was left with is that I am not raising my child; I am raising God's child. How my husband and I raise this gift from God can make a lasting impact within our society. The way we raise our children has the ability to firmly mark our world with God's image, reflected in our children and their future families. I do not casually recommend books and if you look at past reviews, I have offered less than a glowing review for more than one book I've received. This book is a winner and a must have for every mother who is determined to raise Godly children. It would be a excellent resource for a parish parenting group!P.S. I typically donate books I receive for review to our parish library so that many others can benefit from good Catholic books. I may be a bit more selfish and keep this gem on my own bookshelf. Legacy of Love is the fourth book in Kimberly Hahn's Life-Nurturing Love series based on Proverbs 31. In this title, Hahn focuses on parenting teens and young adult children as well as reaching out beyond our family. Like the third in the series, Legacy of Love is divided into six parts focusing on various verses from Proverbs 31 starting with verse 20 and ending with verse 30. The book starts out with "she opens her hands to the poor". Hahn shows readers a multitude of ways to reach out to the poor even if you are not wealthy, Then 'she looks well to the ways of her household" and "does not eat the bread of idleness" while teaching us how to better parent our teens. Part four provides us with guidance for dealing with adult children in the home and transitioning them to marriage which then leads into the fifth part about being an in-law. She wraps up the study with instruction pertaining to being a witness to the world while still balancing our priorities. This is not a typical Bible study as there are not extensive readings from Scripture. There are questions for each book part but they are tucked away in Appendix B. They are divided into two sections: questions for group study and questions for personal reflection. As a personal preference, I wish the questions were placed immediately after each chapter.Kimberly Hahn is a very accessible writer that teaches Catholic truths in a non-threatening manner; her writing style will appeal to the ordinary mom in the church pew. This book will be of great value to the individual reader, but I think even more could be gleaned if used in a small group setting. An ideal group would be a mix of moms of young teens through those with adult children so that younger moms could be mentored.